To begin with I will look at the origins of the established narrative norms in the media surrounding child stars and former child stars. Jane O’Connor has studied the phenomenon of child stars exploring in The Cultural Significance of the Child Star (2008) the way they are portrayed in the media relating this to social expectations of children and childhood. She explores the myth of the child star curse by examining their portrayal in the media, which she finds is mostly consistent from the ‘Hollywood Child Star Era’ of the 1920s through to modern day filmmaking. O’Connor discusses the “detrimental effects of child stardom” and explores the “problems around fame, social identity, and personal fulfilment, which seem to characterise the experiences of many child actors and performers as they grow up” (O’Connor, 2011, p284). She identifies the press as the inventor of the cursed child star narrative finding that the “the link between early success in the entertainment world and future unhappiness as an adult had been well and truly established by the press by the 1970s.” Even if accounts from former child stars leading “’normal’ lives with ‘normal’ relationships’” showed evidence to the contrary (Ibid. p292). “Whether mocking Michael Jackson’s fall from grace, breathlessly reporting Lindsay Lohan’s losses or eagerly observing Britney’s meltdowns, the act of gleefully watching or pushing celebrities from their pedestals has become a major cultural trope” (Cross & Littler, 2010, p396). This obsession this celebrity failure permeates popular culture in the press and notably the three celebrity examples given are all former child stars who have all had a troubled transition into adult life, professionally and personally. The growing up story for the young stars of Harry Potter has not yet taken this turn, but that is not to say that readers would not be fascinated if things took a turn for the worst. The intertextual nature of theatre, film and television is certainly at play in the audience and press reception surrounding Daniel Radcliffe’s adult performances. He carries with him not just the character of Harry Potter but also the extra or intertextual elements of his fame in the form of information gleaned from interviews, articles and so on. Mikhail Iampolski in The Memory of Tiresias discusses the way intertextuality brings new meaning into a text, “In essence the production of meaning is resolved in this "struggle" of memory and the way it is overcome. History is drawn into a text's structure as a semantically productive element”(Iampolski, 1998, p.9). All the extra knowledge an audience brings to the process creates innumerable new meanings, a process that is visible in a quite literal sense in the activities of fans. All the extra knowledge gained by fans creates a very particular viewing position, meaning a text such as a film becomes intertwined with the surrounding culture, as Iampolski comes to conclude, “The intertext, then, binds a text to a culture, with culture functioning here as an interpretive, explanatory, and logic-generating mechanism” (Ibid. p.246-7). “The meanings of a particular cultural object or action are always constructed through a cultural process known as intertextuality, by metaphoric, imagistic, and narrative association with other cultural objects and practices... Meanings [may be] conceived as endlessly referring symbolic chains [or as] meaning webs or systems” (Hirschman, 2000). This intertextual process combined with the ‘curse of the child star’ narrative come together to inform both the press and audience reception of Radcliffe’s adult roles. This is particularly apparent in the narrative surrounding The Woman in Black (2011), as this was Radcliffe’s first post-Potter film role. Throughout the reviews, interviews and articles on The Woman in Black patterns emerge in the topics covered. In interviews growing up and missing Harry Potter is frequently discussed. Radcliffe himself makes several references to the child star curse, actively striving to prove himself as an actor and disprove the myth of his inevitable failure. In the reviews, his acting skills or lack thereof occupy a lot of the word count. In the Daily Mail he received this scathing report: “In his first post-Harry Potter role, he’s dull and inexpressive, and he’s worryingly dead behind the eyes” (Tookey, 2012). And similarly in the Guardian: “I remain undecided about Radcliffe, who endures each shuddering shock with a blank, stoic fortitude that suggests a teenager taking his driving test. He passes, but only just” (Brooks, 2012). For a young actor cast in a huge role at the age of 11 it seems many reviewers are interested to see whether he can hold his own as an actor before any credit can be given. The idea of the luckiness of his early career seems to leave Radcliffe under a great deal of scrutiny as he pursues his adult career. However, Time is kinder, “That tension — that expecting the worst but never knowing when it might reveal itself — plays naturally across Radcliffe’s features and helps him carry what is essentially a one-man show” (Corliss, 2012). As is Total Film “Radcliffe, meanwhile, is terrific, exhibiting the greasy pallor of a haunted man” (Glasby, 2012). Both these reviews taking the negatives of “dead behind the eyes” and “blank” of the previous reviews, as a good portrayal of a haunted, grieving character. “Mr. Radcliffe makes a sturdy, sympathetic center for the tale, even if the ghost of Potter past hovers in his every gesture. Despite Mr. Radcliffe’s best efforts (including the choice to go period), the lingering Potter effect is only natural given that Hogwarts was the actor’s training ground. It will take time before many of us will be able to see the actor instead of his famous character, and time for him to shake that role off too, though it helps that Mr. Radcliffe is no longer encumbered by Harry’s mop and especially his glasses” (Dargis, 2012). The metaphor of Potter as a ghost haunting Radcliffe’s career really serves this narrative well as it does continue to haunt every piece of press surrounding his adult acting career. The reference to his appearance having changed (different hair do and no glasses) as “helpful” shows just how strong the imagery of Harry Potter as a character is. It highlights that Potter is bigger than Radcliffe himself, so the simple act of making sure he looks different in his first post-Potter role is immensely important. This is something that Radcliffe does mention in several interviews, which illustrates just how focussed he is on actively moving on and differentiating between his earlier role and his adult career. In an interview with Den of Geek, he insists that he knows his connection to Potter won’t disappear over night but its clear he’s made a conscious decision to start that process, beginning with how he looks, “I think I look very different in this film, I think it’s a very different type of performance that I give” (Mellor, 2012). He mentions this again in his interview with Empire and this “looking different” coupled with playing a “slightly older” (O’Hara) character seem to be the baby steps to distancing himself from the schoolboy Potter image. “The Woman In Black is very different from Harry Potter. But it's different enough without me having to go all extreme and play a drug- dealing rent boy, or something where people go: "Oh, OK, he's trying to shock us now." I was simply after a good role” (Bamigboye, 2010). “He’s an object lesson in how to survive the curse of being a child star: relationships conducted quietly out of the limelight; brief teenage flirtation with booze swiftly abandoned; rigorous focus on working with the very best people” (McGinn, 2013). “As a pop culture-consuming people, we've become all too familiar with young stars trying to shed their role model image and be taken "seriously" as sexual objects. Harry Potter star Daniel Radcliffe could put them all to shame, however, with his damn funny, but oh so humiliating appearance on Extras” (Semigran, 2013). By poking fun and playing with audience expectations Radcliffe was taking control of the “child star curse” and gaining ownership over this narrative so that people could take him seriously as an adult performer but also see that he did not take himself too seriously. Jane O’Connor mentions Radcliffe and his fellow young cast members in The Cultural Significance of the Child Star where she ruminates as to why they have “so far avoided, or at least been predicted to avoid” (O’Connor, 2008, p77) the curse. She finds that it is potentially due to their middle-class upbringings and supportive parents. She writes, “[Director John] Boorman’s description of Daniel as a ‘lovely kid’ with a ‘natural manner’ distances him from the stereotypical precocious child star,” which is usually characterised as working-class and succumbing to “the aspirational power of a life in show business” (Ibid.) The family friendly positivity surrounding the Harry Potter franchise may have actively stemmed the breakdowns of its child actors. This could have something to do with its British home. In conversation with Jo Rowling, Radcliffe discusses his very positive experience as a child actor on the set of Harry Potter in the UK, “In England it’s different than in America. In America they treat you first and foremost as a star and then as a child, whereas actually you should be treated as a kid first and then an actor second” (Ravenclawdavid, 2013). It seems from this account, as with many childhoods, if a child star is raised in a supportive environment and “treated as a kid” it may be less likely they go off the rails in response to their experiences. Clearly Daniel Radcliffe has been aware of the “child star curse” as a narrative in the press for quite some time and so has the determination to avoid it at all costs and from his point of view it could have been worse if he had not been filming in England. While under a great deal of scrutiny from the press as they grew up, the Harry Potter trio clearly greatly benefitted from having loving, supportive parents but also the love and support of a vast fanbase. The fandom surrounding Harry Potter is huge and has had a significant presence in the online evolution of fans and their creative activities. Fans of the series often talk about the process of “growing up with Harry” as a constant force for good throughout their childhoods and teenage years. Not only have fans watched Daniel, Rupert and Emma grow up on screen, but they grew up along with Harry, Ron and Hermione on the page too. There is an intense investment in the lives of the characters and so also with the actors who played them. Therefore support for the trio’s adult acting endeavours remains resolutely strong. For many fans it was the exciting next step in the journey along with Daniel Radcliffe that had begun in 2001. The intertextual nature of an actor’s performance is heightened more so in the case of Radcliffe’s adult roles. The “ghost” of Harry Potter continues to follow him as can only be expected from such a colossal worldwide franchise success. He has referred to the experience as a “springboard” and not a “straightjacket” (Ibid. ), but for audiences it can be very hard to get away from the image of the boy wizard. For invested fans further research into Radcliffe’s life widens this intertextual “web” creating new layers of meaning when viewing his work. For fans this is a positive and rewarding process, as pleasure is gained from time spent researching, sharing and discussing details with other fans. Harry Potter fan sites such as MuggleNet and The Leaky Cauldron continue to post news of projects the Potter cast are now involved in, illustrating the continued interest and involvement in the lives and careers of the actors. Fans are therefore very supportive of these projects, which can be seen across various online spaces including in the Snitchseeker forums, in comments on The Woman in Black YouTube channel and on its Facebook. On Snitchseeker the tone is mostly positive with fans expressing their concerns over the “weirdness” of watching Radcliffe and his fellow Potter cast member in new roles. In a thread posting pictures of both Radcliffe and Tom Felton (Draco Malfoy) on set in their first post-Potter roles PhoenixStar writes, “Cool! It still seems so weird to me to see them in other roles, but very happy for them all.” Hermione Granger27 writes, “its weird [sic] to see him in a role other than Harry.” Amandagayle writes, “So excited to see both of their projects! It won't be so weird seeing them in other things now that Potter is over” (Masterofmystery, 2011). So while fans are primarily supportive of Radcliffe, the intertext at play involves their own emotional connections to his role as Harry and is therefore potentially “difficult” to deal with. The “ghost” of Harry is in this case haunting the fans. Elsewhere jokes and puns about spells and other Potter characters continue to fill up the comment spaces. On YouTube under the trailer for The Woman in Black, “that is not Daniel Radcliff, that is and always will be harry potter.” And “LOL when they called him Arthur I was like, his name isn't Arthur it's Harry!” (TheWomanInBlackMovie, 2011) But amongst this Harry fans are fighting Radcliffe’s corner urging the rest of the audience to move on too, “I wish people would stop with the Harry Potter Jokes. I myself am a big HP Fan but really people need to accept he is not playing Harry in this movie” (Ibid.) 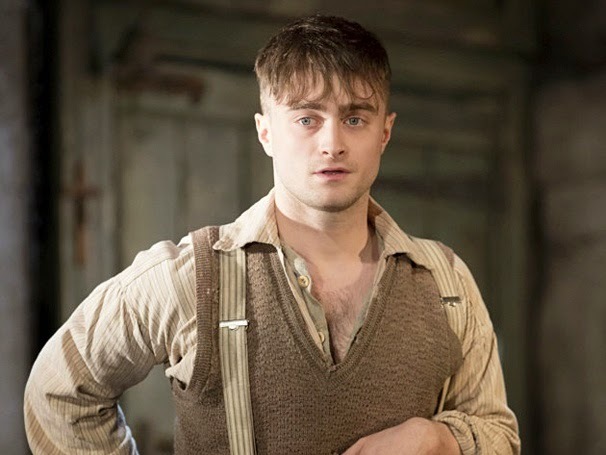 Fans are actively shaping their own intertextual readings of Radcliffe’s adult roles, by attempting to separate their love of Harry Potter and Daniel Radcliffe in order to fully enjoy and support his performances. “Yet over the past half-dozen years, he has done everything he possibly could to distinguish himself from Harry: riding a horse naked and aroused on stage in Peter Shaffer's Equus, limping around stage as Billy Claven in The Cripple Of Inishmaan, haunted by ghosts in the horror movie The Woman In Black. Now he's at it again, with another part from which Harry Potter would run a mile: in Kill Your Darlings, he plays gay beat poet Allen Ginsberg, sexually infatuated with the dangerous Lucien Carr” (Hattenstone, 2013). Harry will always be this “ghost” for Radcliffe, even if it is used as a marker for success and how far he has come. The “ghost” haunted fans too as they set out on the journey with him into his adult acting career, concerned about how “weird” it would be to see such a beloved figure in new roles. The intertextual relationship with Radcliffe’s post-Potter roles does not necessarily impede or increase enjoyment for audiences, but instead creates an entirely different viewing experience for every single person within a vast “web” of intertextual meaning. Austin, T., and Barker, M., eds. 2003. Contemporary Hollywood Stardom. Arnold: London. Cross, S., Littler, J., 2010. Celebrity and Schadenfreude. Cultural Studies, 24:3, p.395-417. Dyer, R., 1998. Stars. British Film Institute: London. Iampolski, M., 1998. The Memory of Tiresias: Intertextuality and Film. Berkeley: University of California Press. O’Connor, J., 2008. The Cultural Significance of the Child Star. New York: Routledge. O’Connor, J., 2011. From Jackie Coogan to Michael Jackson. Journal of Children and Media, 5:3, p.284-297. O’Connor, J., 2009. The Demonisation of Charlotte Church. Journal of Children and Media, 3:2, p.136-151. Zierold, N. J., 1965. The Child Stars. Macdonald & Co.: London. MuggleNet and The Leaky Cauldron also have popular and well-used forums, however at the time of researching these forums had been taken offline. I believe this is temporary and due to well needed site refurbishment, as these have been active fan spaces since before the first film in 2001. The nature of social media now means that there is space for comment almost everywhere, however forums still hold weight as important spaces for fan discourse.